Dougie Wright (also credited as Douggie Wright) was born in Leeds in 1937. He is a self-taught drummer and percusionist, who's musical journey spans every genre through a period in British musical history which changed the face of popular music. His first came to prominence as a jazz drummer - strange how so many of the Wurzels have their roots in jazz! - during the British beat boom of the late 1950s and early 1960s. He played with the Bill Marsden Band in Leeds before teaming up with the band's former saxman Jimmy Stead in the John Barry Seven (replacing Ken Golder, the group's original drummer). 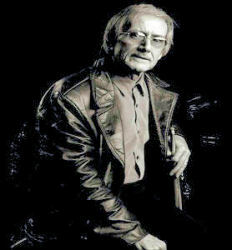 Dougie then joined the joined the Ted Taylor Four in October 1962 before dropping out of the jazz scene to develop his reputation as a session musician, based in London. Dougie became a highly respected session drummer who played on over seventy hit records through the 1960s and 1970s, including Hi Ho Silver Lining, Je T'Aime, World Without Love, Make it Easy on Yourself, Beautiful Sunday, My Coo Ca Choo, What do you Want and albums by Cilla Black, Tom Jones, Engelbert Humperdinck, The Wurzels, Petula Clark and many more international artists. Although never a true member of The Wurzels - we have no record of him playing at any of their gigs - Dougie was drafted in to provide some of the drumming on the 1969 Carry On Cutler! 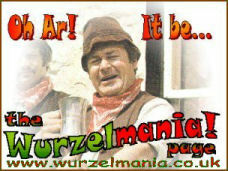 album along with drummer Eddie Clayton, the 1975 The Wurzels Are Scrumptious! album (along with drummers Andy White and Tony Fennell), and again along with Andy White - and rather cryptically credited 'for their support' - on the 1976 Combine Harvester album. Sadly this means we have no way of knowing which songs Dougie (or Eddie, Andy and Tony) actually drummed on. Dougie's claim to Scrumpy & Western fame is that he co-wrote the song Good Old Somerset on the Golden Delicious album; an album which he never drummed on. Having missed out on the Golden Delicious and Give Me England! albums, Dougie is the only credited drummer on the 1978 I'll Never Get A Scrumpy Here. By the mid-1970s, Dougie moved away from session work and went back to his first love - jazz. He joined the Eddie Thompson Trio and later with the Harry Stoneham's Band; supplementing his income by teaching drumming. In the 1990s, he was living in Leicester and teaching music at the college level. Dougie is currently drumming with 'Dixieland Fun Band' Fidgety Feet (pictured right) where is "having fun by providing percussion sounds in this band which he feels sure is quite unique in style and appearance and enjoyed by people of all ages who like to tap their fidgety feet and enjoy fun music". Have a look at the pictures of the band on the front of their wbesite, and you will see why Dougie was under-used by The Wurzels. Anyone willing to dress up like that should be more than happy dressed and performing live as a Wurzel! Dougie has his own website (under construction) at http://www.dougiewright.com.